Australian SAGE Tour delegates learned about the unique care model provided by Royal Hospital Chelsea during an event arranged by NCF and Person Centred Software. During the day the delegation learnt about the UK sector from leaders representing ARCO, Care England, CQC, Skills for Care and NCF. The study tour was designed to give SAGE delegates insight into the older people’s systems models of care in England. During these tour participants visit significant public and private organisations. The visits to older people’s retirement villages and care homes highlight successful models of care and give an overview of the current English systems. At the end of the day key decision makers from the UK, including the NCF Board member Karen Knight, CEO of Norsecare, and Sue Porto from Brandon Trust joined the Australian delegation for a drinks reception hosted by Person Centred Software and the NCF team. The SAGE delegates are here for two weeks visiting a range of care settings across England, including NCF members MHA, Abbeyfield and St Monica Trust. SAGE Tours offers innovative study tours to the aged care and retirement living industries. 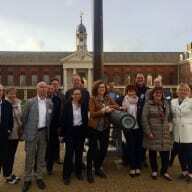 The post NCF and Person Centred Software host international event at Royal Hospital Chelsea appeared first on Care Home Professional.